The Sashimi of Aji is common Sashimi in Japan. 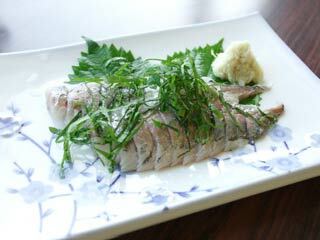 Aji is a horse mackerel. When you make sashimi, you have to cut a fish into three pieces. It is called "Sanmai Oroshi." 2 meats and 1 bone. Making Sashimi called "Sanmai ni Orosu," means cut a fish into 3 pieces. This is what you need for Aji no Sashimi. Aji (horse mackerel), Oba (beefsteak plant leaf), and Ginger. First cut off the head. Cut it from the under the fin. Then cut the bottom to remove the organs. Place a knife just above the back bone and slice it to side. Flip it and do it again. See, now it's three pieces. There are also bones in the middle here. Use the bone pickers to remove them. Let's make granted ginger. Peel and grate it. Cut Beefsteak plant leaf finely. Cut Aji into one bite size. Place Aji on a dish. Add fine-sliced beefsteak plant and ginger. When you eat Sashimi of Aji, no wasabi but use ginger.